This dish is a good example of the vibrant personality of Asian flavors, and it is very easy to put together. 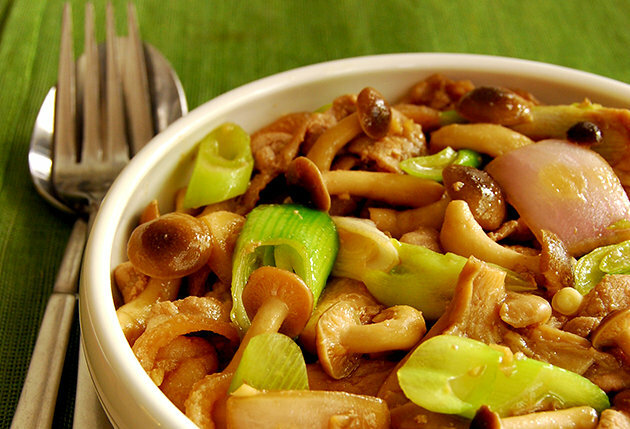 You can substitute the mushrooms here with other Asian mushrooms such as shitake, or even button. Feel free to add other vegetables as well. Baby corn, broccoli, or asparagus will all work well. Make sure to slice the vegetables into more or less similar sizes so they all cook at the same rate. Serve this atop steaming hot white rice. 1 Mix the soy sauce, Shaoxing wine, black vinegar, hoisin sauce, sugar, sesame oil, and cornstarch in a bowl until fully combined. 2 Pat the pork belly pieces dry and combine with the soy sauce mixture, making sure the mixture is evenly spread throughout the pork. Leave to marinate for 15-20 minutes. 3 Heat a wok over high heat. When hot, add 1 tablespoon of the vegetable oil. Add the pork and marinade and stir-fry until pork is just cooked. Do not overcook. Remove the pork from the wok and place the wok back on the stove. 4 Pour the remaining 1/2 tablespoon of vegetable oil into the wok. Add garlic, onion, and ginger. Sauté, stirring, until fragrant and onion pieces start to soften. 5 Add oyster mushrooms and toss. Add shimeji mushrooms and toss to combine. If the mixture looks a little too dry, add about a tablespoon of water and mix, sautéing until mushrooms soften. 6 Add the leeks, toss once or twice, and then add back the pork. Give everything a final toss, just to get it all combined, then take off the heat and serve immediately. I want to create this stir fry sauce and to taste if this dish is really delicious. But I don't have a resources to copy from it. I need this because I have a beef stir fry and I don't have a sauce for it. The style of your article is very unique and very helpful. Keep sharing! thanks for your appreciation. :) most of the ingredients are available to any chinese/asian food stores that might be in your area. keep cooking!